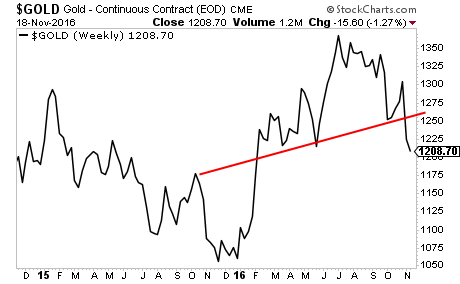 The financial world is awash with claims that the Gold bull market is over. For certain the sell-off in the precious metal has been brutal with Gold taking out critical support. However, worries about the precious metals’ bull market are overdone. First of all, Gold is a very volatile asset class. This is obvious, but you’d be amazed how many investors forget this. It is not uncommon for Gold to move 3% in a single day. And 5% weekly moves are not uncommon. Secondly, the macro environment continues to favor Gold. Currently Central Banks are withdrawing from additional monetary stimulus and have begun calling for Governments to pick up the slack via fiscal stimulus. Let the markets tank 10% or more…or the US enter a clear cut recession and the printing presses will be cranking once again. This time next year, there will be multiple new QE programs underway. We’ve already reached the point at which Central Banks spend $180 per month on QE. Next time it will be $250 or even more. These plans will be sending Gold through the ROOF. Indeed, we've uncovered a secret document outlining how the Fed plans to incinerate savings.